Multilingual Manual in English, Chinese(in both simplified&traditional character), Korean, Thai and Japanese, Don Quijote(famous all-kind-of stuff shop in Japan) discount coupons convenient SIM conversion adapter & SIM pin Support from cutomer center in English,Chinese,Korean and Japanese 24hours a day, 365days a year The validity would be calculated from the next day you have done the set up(opening procedure) of SIM card. ■Notes ・The JPSIM PREMIUM service is a mobile data communication service compatible with NTT doco's Xi area and FOMA area. ・If the SIM card has not been used during the selected time period after purchasing, you may not be able to use this service. ・This SIM card is for data communication only. ・Voice calling and SMS service are not available. ・The validity of SIM card will be calculated from the next day of opening procedure(activation), and able to use up to 23:59 of 30th day. ・This SIM card will be unavailable in 30days from the next day of opening procedure(activate). ・Please be aware that due to the system maintenance, this SIM will not be able to activate from every Tuesday 10 P.M. till Wednesday 9 A.M. Japan time. 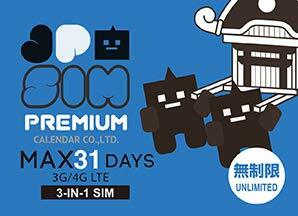 Prepaid Data only SIM card usable in Japan,you can use up to 30days unlimited. Prepaid, no need to register credit card for opening procedure, no initial cost needed too. Disposable so no need to return.Easy procedure for set up. Based on Docomo's line(most major carrier company in Japan) which covers all over Japan. This SIM card has to be activated(open procedure) in precise period. The validity of this product is end of Jun,2019. Please activate until this undermentioned date. If you have any questions about this product by JPSIM, contact us by completing and submitting the form below. If you are looking for a specif part number, please include it with your message.